When searching for a piece of Renaissance art, I searched for something that would jump out and grab me, something that I would like, something I could put on a wall in my home. 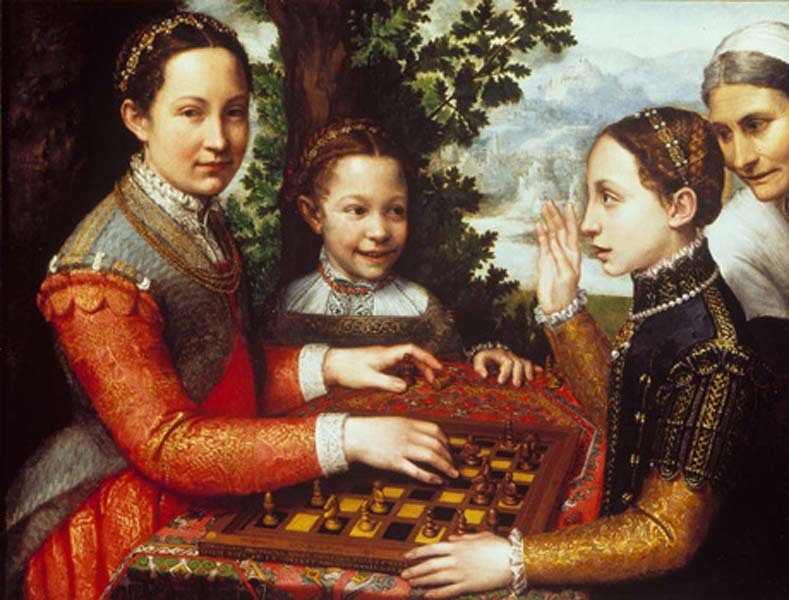 The Chess Game by Sophonisba Anguissola did just that-it grabbed me. As I read about her life with her family in Italy and how she came to begin painting, eventually ending up as a lady-in-waiting and court painter to the Queen of Spain, I became more and more impressed and interested in this important woman of the Renaissance. Born in 1532, the daughter of liberal humanist aristocrats, Amilcare and Bianca Anguissola, Sophonisba and her siblings, six sisters and one brother, all had the traditional humanist classical training of the era – they studied music, Greek, Latin and the sciences. During the Renaissance, women were generally considered the object of art-not creators of art. However, Sophonisba actually studied under Bernardino Campi and Bernardino Gatti, renowned Italian painters whose work was done in the Mannerist style of the late Renaissance. She was known to have travelled back and forth from Rome to visit with Michelangelo – and some scholars see his influence reflected in her work by the depth of character in her subjects, their warmth and tenderness. It is reported that Michelangelo recommended her to Cosimo di Medici, and this in turn led to appointment to the royal court of Philip ll of Spain as lady-in-waiting to his new queen, Isabella, daughter of Maria de Medici. She chronicled life with her family in several sketches and paintings, but it was The Chess Game, hanging in the Anguissola home that Grigorio Vasari, the Italian Renaissance painter most famously known for his biographies of other artists of the times , found appealing. He said of Sophonisba, “Anguissola has shown greater application and better grace than any other woman of our age in her endeavors at drawing; she has thus succeeded not only in drawing, coloring and painting from nature, and copying excellently from others, but by herself has created rare and very beautiful paintings.” Sophonisba was already in Spain as the royal portrait painter at the time of his praise. I was continually drawn back to the delightful genre piece that depicts Sophonisba’s sisters in a game of chess. The initial thing that drew my eye was the impish grin on the face of the youngest sister. The lifelike gaiety was in stark contrast to the more formal portraits of the time. The setting is out of doors, in soft tones using the new sfumato technique of the Renaissance (gently blending the colors to soften the lines) which allows the background to remain just that, a hazy far-off place. She takes from both city and rural landscapes to create her own imagined yet realistic looking world. The status of the family is revealed in the rich brocade gowns and the attendance by a servant. The fact that the girls are engaged in a friendly game of chess is something that is extraordinary in and of itself. In the age of the Renaissance, chess was thought to be a game of intelligence and was therefore commonly reserved for the gentlemen of the day. Here, the girls are happily enjoying the completion of a match. The youngest, Europa, who is the one that really drew my attention, is casting a glance at her sister, Minerva, delighted in the completion of the match. Did she prefer the older sister, does this mean it’s her turn to play or did the older sister, Lucia, manage a quick end to the game with a hitherto unused move? I can’t help but notice that the servant is not only in attendance, but she appears to be engaged in watching the game as well, showing that even a common person could have the ability to comprehend the game. Another aspect of the painting is the hierarchy of the sisters, evidenced by who they are looking at. The Europa is looking at Minerva, Minerva is looking at Lucia in surprise and surrender, while Lucia looks directly at the eldest sister, the artist, Sophonisba. It is interesting to note that all the girls were artists, but Sophonisba is the most famous – as she was when she lived. “I must relate that I saw this year in the house of Sofonisba’s father at Cremona, a picture executed by her hand with great diligence, portraits of her three sisters…who appear truly alive, and are wanting in nothing save speech…executed so well that they appear to be breathing and absolutely alive.“ It is thought that perhaps it is this praise by Vasari for The Chess Game that elevated it to her most famous work. Since I had never seen The Chess Game before or any of her other work, I cannot comment on that aspect of it, other than to say that it is the picture that got my attention as well. I am living north of the Arctic Circle, working at an elementary school full time and working on my college degree. You have a really great blog! I really love how involved and how impressed you were with the life of the artist. I felt that the fact that you were impressed by the artist made you more passionate about your assignment and your response to her portrait. Your information is great and you did an outstanding job citing your work. Your reasons behind your selection of this portrait are very obvious. However, I had trouble finding some of the required criteria. For instance, what influence during the Italian/Northern renaissance do you connect your portrait to? Why do you think the maid/servant was engaged in the chess game? When I look at this particular piece of art work it seems to me that she is simply watching the two females play chess. I think your idea of giving a back ground brief of the artist was great. However, the back ground description of the artist was very lengthy and took away from the actual piece of art that you were supposed to be describing. I think this piece of artwork was a great choice! It shows family unity. I love that aspect considering the fact that my job requires me to be away from my family and love ones. I really enjoyed reading your blog. Keep up the good work! Thanks for your comments – I’m sorry I wasn’t clear about the influence. She had humanist parents and studied with some of the great Italian Renaissance artists, including Michelangelo. Her work was clearly influenced by the Italian Renaissance artists, although the humanist aspect was more prominent than any religious leaning. When I commented that the servant was engaged in the watching the game, I was pointing out that she could understand what was going on, not that she was involved in the actual play. I reached this conclusion because of the look of interest that I perceived on the face of servant. If she did not understand the game she would undoubtedly be looking elsewhere, with a bored look. One thing that I did not mention is that I have three daughters, and it was only in retrospect that I realized how that had influenced my choice. And yes, I do tend to go on a bit once I get going on something – Thanks for taking the time to read it! I really enjoyed this blog! I am getting ahead in this class so I have to comment on old blogs but I’m really glad I chose yours! As I was reading I was very interested that you chose an Italian Renaissance artist especially since I enjoy those artists more than the Northern Europe Renaissance artists. I liked how you combined your artist with the Medici family, I was waiting for them to be mentioned and once I read that part I said, “ahh she knows what she’s talking about!” I have to disagree with the first comment though. I think giving a lot of information on the artists background helped us understand the artist more and fully grasp why, or what, the artist was going for in this painting. What I love about this painting is the little girl in the middle. The expression of sheer joy on her face relaxes the painting more and makes it more enjoyable to look at. The colors are so bold and the facial expressions of the other women are so hard that for me, it is hard to look at and smile, but this little girl I believe completes the painting and makes it much more enjoyable. Loved this post you did a great job!